I have a secret. I love cookbooks. I mean I really really love cookbooks. When I am traveling I like to pick up a cookbook from whatever city/country I am visiting. I have probably 30 cookbooks covering Tex-mex to Amish favorites and everything in between, but if I had to give up every cookbook except one I would save this orange beauty. 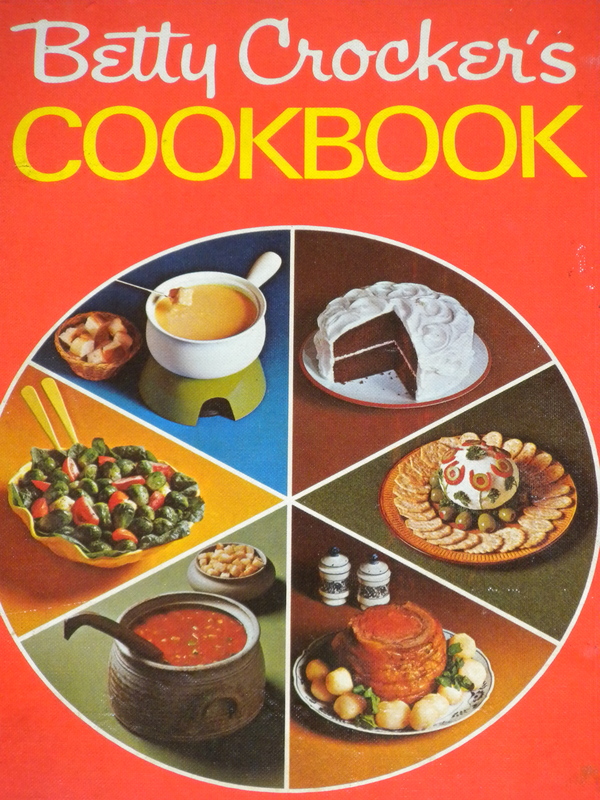 I grew up eating meals from this delightfully retro cookbook and I used to love flipping through the pages and imagine making things like petit fours and baked alaska. When I left home my very sweet mother tracked down another copy for me to have in my own kitchen. After a recent week of unrelenting rain, disappointing dinners, and headaches of the literal and figurative sense, I needed some serious comfort and a little boost to my cooking confidence. I turned to Ms. Betty for inspiration, and she did not let me down. The first thing I made was a classic apple pie, which was perfection, expect for one small detail…. I ran out of butter so there was no top crust (like I said, it was one of those weeks), but that is not Betty’s fault, and it was still delicious. Next I made curried chicken salad which was fantastic, even if you don’t like curry. But really, who doesn’t like curry? These small triumphs led to me visiting some of the other lovely ladies on my bookshelf, like Nigella Lawson and Ina Garten. Flipping through those cookbooks made me feel like a capable adult again, instead of the flailing nutcase I was starting to resemble. It has long amazed me how powerful a good meal can be. After a long day at work I can either grab something easy and shove it in my mouth as I walk through the front door, or I can spend a few extra minutes making a meal. The easy way stops my stomach from growling, but the extra time I put into a proper meal transforms my early evening hours into a time of leisure and enjoyment. I feel like a beef stroganoff or a pumpkin chiffon pie might show up on my table next, or I might just toss the dice and pick a random page in a random book. Either way it is nice to be back in familiar kitchen territory and those ruined dinners that have been haunting me lately are starting to fade into the backdrop. Good to see and hear about your hiking/ biking / running – all quite familiar as your cousin Kirk has done triathelon’s, cliff ice- climbing (frozen water falls) and so forth. familyhistory. For example – Aunt Terry had exceptional ability to run track, pitch a baseball or football equal to most male competitors. Kirk did make it to the Eastern hockey league in ice hockey, Skylar is a gifted Alpine ski competitor. For myself – I did paddle a 16′ canoe with another crew member for central Alberta to the Arctic Coast. Roughly 2500 miles of fast to peaceful rivers starting in Peace River Alberta through Wood Buffalo Park to Great Slave Lake – down the McKenzie to Tuktoyuktuk. This land is isolated, wild and unforgiving to travel, but hospitable while visiting Indian camps along the way. Sailing West Coast / East Coast through ancient locks and canals, ending up at the place Alexandra Graham Bell conducted his experiments and multiple inventions while locating at Baddeck P.E.I. Myself -racing vintage British sports cars is why your dad and I shared many conversations about his MG.
During summers I drive my 69 MGBGT, enjoying trips to the mountains where driving experiences are optimized. Kirk lives in Victoria, B.C. and drives his 71 MG roadster year-round. Again you would certainly enjoy Tommie and Kirk, both of whom have made it part of their life missions -to experience and soak in life the way you also have described. Stay well and keep living as you are.